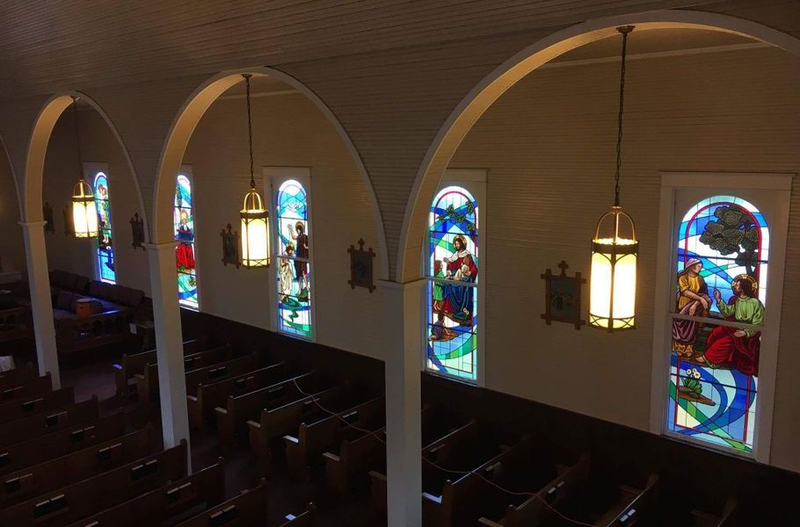 In 2014, Laws Stained Glass Studios installed (2) cathedral glass windows (size 38" wide x 115" high) at the St. Augustine Catholic Church in Natchez, LA. Each window contained a hand-stained floating figure. One depicted St. Augustine and the other depicted St. Monica. The surrounding glass was made of cathedral glass with no staining. 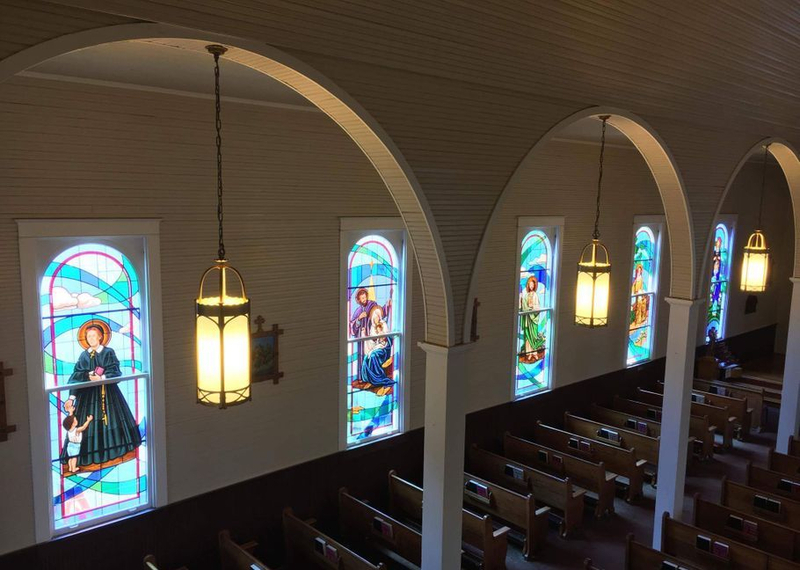 Normally, the leaded glass windows are installed inside the wood frame, but the church had some existing windows that were installed into the wood sashes. So, Laws installed the windows into the existing wood sashes to match the others. 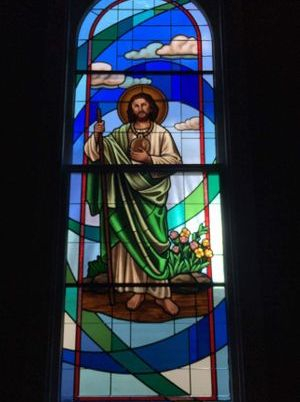 In 2017, Laws Stained Glass Studios returned to install (14) more windows including eight sanctuary windows (size 38" wide x 115" high), a stairwell window (size 26" wide x 56" high), a 44" diameter round window, an interior transom (size 72" wide x 36" high) and an exterior transom (size 56" wide x 27" high). All of the windows were made of cathedral glass with hand-stained floating figure/scenes to match the existing windows. The floating figures for the sanctuary windows were as follows: "The Baptism", "Blessing the Little Children", "Woman at the Well", "The Garden of Gethsemane", "Pieta", "The Holy Family", "Saint Henrietta Delille", and "Saint Jude". 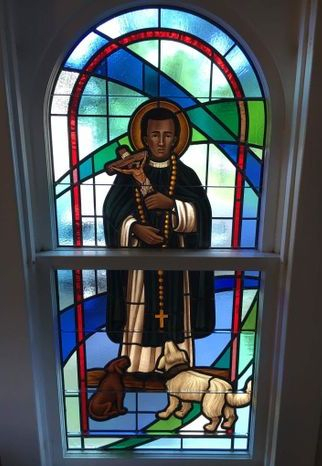 The stairwell window depicted "St. Martin de Porres". The round window has a symbolic depiction of the "Trinity". The interior transom has the symbol of the Lamb of God sitting on the Book of Life with the seven seals. The exterior transom has a bust of "The Good Shepherd." 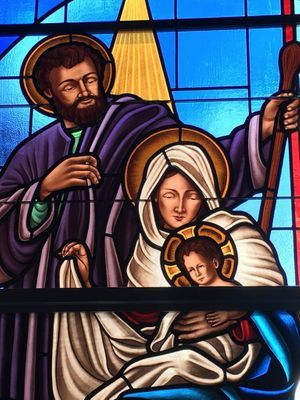 Close-up of the "Holy Family"